Back again? Don't say I didn't warn you, just don't go there... There's a Big Sale at Little Miss Muffet Stamps. BIG. Claudia's Tutu here, may just well be one of the Sale Items. Just sayin'! She is just adorable Faye..gorgeous colouring and love her pink tutu.Love your easel design...so pretty. Wonderful card Faye, gorgeous colouring and design. Lego... ouch! Awwww she is such a sweetie. I love your fabulous design and stunning colouring. I always struggle with taking a decent photo of easel cards, must remember the lego tip! A gorgeous card faye. Love the image and your fab colouring. Oh my word! This is just so beautiful, so sweet! I'm jealous of your pastel pink-don't think I've ever achieved that!! Gorgeous!! 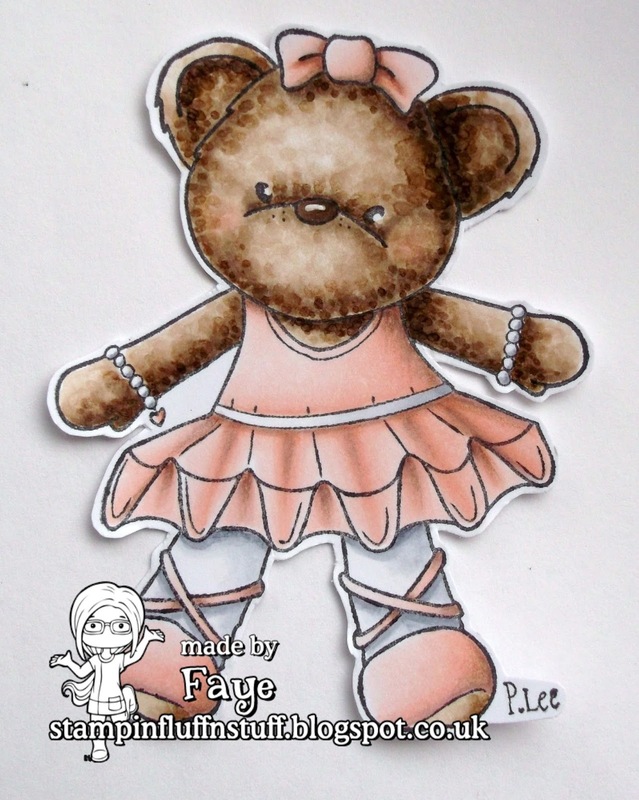 Well you know how much I love this little bear in her fabulous pink tutu - hmmmm do you think a tutu like that'd suit me? Maybe not, I'd probably need a tutututututu!! Thank you sooooooo much for being our Guest Designer at In The Pink - hopefully I'll be able to talk you into it again in the future sometime! Have a lovely weekend hon.. This is quite different from your usual style! Love the feather decoration! And how come we're not making circle shaped cards more often? Absolutely gorgeous! Such a cute image and your embellishments are fabulous - I love the feather! This was the first time I'd made a fancy fold card and I know exactly what you mean about taking a photo of them!! This little girl is over the top adorable! You did a fabulous job coloring her! I need to stop in Miss Muffet:).